A terrifying experience with my sick newborn sent me into a downward spiral of nightmares, depression and self-harm. It took a 24-day trip through a remote region of Central Asia to find myself again. Deliberately, with resolve, I placed a hammer on the kitchen counter. I was no longer crying, at least not right then. Finally, I had a plan, and I felt better for it. I’d begin by smashing my hand. The pain, I hoped, would distract me from the thoughts I was having of hurting my newborn boy. I sat down on the kitchen floor and leaned against the cabinets. I was so tired. It was January, and hot. The days were long and the nights short. Seasons are upside down in New Zealand, where my husband and daughter and I had moved earlier in the year from New York. We’d come here to follow my husband’s dream of returning home. I hadn’t given much thought to how I’d feel moving to a new country with a young baby, how it would be different from when I’d moved overseas as a single, working woman. I suppose I’d just shrugged my shoulders and assumed I’d regard it as another adventure. I was 30-years-old when I followed my dream of becoming a foreign correspondent. That was ten years ago. I’d been working on Wall Street and making good money. Everything I’d ever salivated over while growing up in Ohio had become mine for the taking: designer clothes, expensive dinners at fancy restaurants, air travel at the front of the plane. It was hard to let go of these trappings to pursue the uncertainty of a dream. But once I did, my life changed dramatically. I swore off love. Love and marriage don’t go hand in hand with single-minded career pursuits, I argued to coupled friends and family. If I wanted to be me at full tilt, I insisted, I’d have to go it alone. I traveled to Ulaanbaatar, Mongolia, for a journalism internship. I ended up anchoring their news. Back in New York, I landed a job with CBS Evening News with Katie Couric. I wrote a book. And then, I got an offer from Sinovision, a U.S.-based Chinese-language television network, to host a TV show about people who’d successfully pursued their wildest dreams. For me, this beat was perfect. There was the opera singer who’d started out as an orphaned teenage factory worker in China, the international concert pianist who was told as a child he’d never be good enough, and there was the little Mongolian girl whose father died trying to help her achieve her dream of becoming a circus act. There was even Lou Reed. I swore off love. Love and marriage don’t go hand in hand with single-minded career pursuits, I argued to coupled friends and family. If I wanted to be me at full tilt, I insisted, I’d have to go it alone. So I was taken by surprise when I fell in love, got married, and had a baby girl. I did wonder if marriage and I would get along in the long-term, but I was too happy to worry much about it. Something was wrong with our daughter when we brought her home from the hospital. For the first few weeks of her life, she choked, turned colors, and occasionally foamed at the mouth. Doctors shrugged their shoulders; they said she’d probably grow out of it. In the meantime, while I waited for a newborn to grow out of being unable to breathe, and while my husband was working about a hundred hours a week, it was my responsibility to keep our little girl from choking to death. I remained alert at all times. I watched videos showing how to resuscitate newborns and, each morning, I wrote the instructions on my hand. I bought lots of bulb syringes, and placed them strategically throughout the apartment, so that I could suction the baby’s airway quickly in an emergency, without wasting precious time looking for a syringe. I researched how much time a brain can sustain itself without oxygen before it begins to suffer permanent damage. I slept in fits and starts, and not very much at all. I can’t remember if I ever thought about how far my life had wandered from what I thought it should have been, but I hardly cared. I was consumed by the fear that I’d nod off to sleep as my daughter silently died. Eventually, the choking stopped. And though I continued to keep vigil over her, for fear of a relapse, life did go on. Like many couples with a young baby, my husband and I grew weary of New York City. Subways were crowded, daycares were full, our local swimming pool required a pre-arranged booking time, and the city stunk of fumes in the winter and garbage in the summer. It was time to go, we said aloud. Privately, in the calmer moments of my otherwise frantic and anxious existence, I knew that leaving New York was leaving my dreams behind. But by then I didn’t really have a choice; I needed to get away. We decided on New Zealand. And then one day not too long after, we were actually in New Zealand. I no longer had the budding journalism career I’d had in New York and Mongolia. Now I was a wife and mom living in the suburbs on the edge of the planet. In one plane journey, I had become everything I thought I never should be. My entire world, and all its possibilities, had narrowed. Still though, I loved my husband and daughter, and about a year later, we had our son. Because I’d never really gotten over what had happened to my daughter when she’d been an infant, I projected onto my boy all the fears I’d had of my daughter dying. My son was perfectly healthy, but you couldn’t have convinced me of that. Just as I had done with my daughter, I hovered over my son, waking sometimes every few minutes to rush to his side. With extreme anxiety came chronic sleeplessness, and it wasn’t very long before I went crazy. During those first few sleepless months with our son, I received an email from a friend inviting me on an expedition to explore eastern Kazakhstan. At the time, nothing could have seemed more laughably unlikely than me getting on a horse and riding through Central Asia. I probably said no to the invitation, but I can’t remember saying anything at all. The sleep deprivation was turning me into someone I barely recognized. I cried more often than I didn’t; I even cried in my sleep. I became furious over the smallest of things, like the baby being fed solids that were too lumpy — what if he choked? I picked fights with my husband, probably because it helped me ignore the turmoil in my head. I was paranoid, angry, resentful, and now very sad about how my life had changed. One Sunday last March, I couldn’t stop crying. I’d woken up crying, and I’d been crying at night in a fitful sleep. Our boy was three months then, and perfectly healthy. But I wasn’t healthy, not mentally. I obsessed over the baby being unable to breathe; I had nightmares I was smothering one or both of our children to death. It would be so easy, I thought constantly, for a baby to slip away. On that Sunday morning, I’d driven down to the local foodie markets. It wasn’t so much about the destination as it was about the distraction: I just wanted to stop breaking down. With my back to the harbor, I sat at the markets facing the steep hillsides that Wellington homes are built into. I watched as a woman off in the distance walked out onto her deck, which was perched over a cliff. She walked to the edge, leaned onto the railing, and sipped from a steaming mug. Fascinated, I continued to watch her. All she’d have to do, I thought, was climb over the railing, and let go. It was at this point that I sought the safety of the hammer, placing it on the kitchen counter to have some feeling of certainty that I would take aim at myself first, and not my baby. I was scared and ashamed of these thoughts of suicide and murder, but finally I admitted all this to my husband. It was the hardest thing I’ve ever had to do. Right away, he took me to the doctor, who diagnosed me with post-natal depression. She prescribed medication and a series of meetings with a psychologist who specialized in maternal mental health. Relatives came to stay. They watched over the baby and me day and night, which allowed me the curative sleep I so needed. Within a few weeks, I was feeling much better. Within a few months, I felt almost “me” again — almost. There was still the question of who I was these days, and the little voice in my head asking me this question was awfully persistent. It was loudest at night when I lay awake, wondering how to resurrect the part of me that loved what I’d been doing before I became a mother. A second and third time, my friend invited me on the expedition to explore eastern Kazakhstan. I don’t really know why she kept inviting me. Like me, she was a mother of two young kids. This made a big impression. If she could do it, could I do it too? There were plenty of reasons why I shouldn’t go, and those were obvious. But there wasn’t a single reason why I couldn’t go. And then it began to dawn on me that this trip might be just the thing I needed. Thinking back to all those stories I’d done about people pursuing their passions, I began to wonder if I could join this expedition to Kazakhstan in search of someone following a dream, so that I could tell his or her story. It would mean I was returning to work, and returning to work would mean a great deal. It would restore my sense of self, something that had been missing for a while. My husband agreed; it was he who urged me to go, and eventually insisted I go. In July, when my baby boy was seven months old, and my daughter three, I left for Kazakhstan. Before the trip, I’d done as much as I could to make sure the kids would be not just well cared for, but happy. This required a lot of logistics, which I could really only attempt to arrange beforehand. Before I even left, I sent my daughter twenty-four postcards, one for each day I’d be gone. On each card, I wrote about what I expected to be doing on that particular day. I sent them from our local post office; I wanted to be sure she got all of them, and right away. For my son, I recorded myself singing lullabies, and I made two posters with pictures of my face, so that he wouldn’t forget it. I pointed out on our globe where in the world I’d be going, and told my daughter why; I told her that it’s important to always maintain a sense of self in life, to try to do what you love; to follow your dreams. Four plane rides, three overnight layovers, and one hot and dusty eight-hour caravan ride later, I was in eastern Kazakhstan. We were a mix of nationalities: New Zealander, American, British, as well as our Kazakh and Mongolian guides and rangers. They had come to explore the Altai Mountains by horse. I had come on a mission. That first night, at the base of the Altai, we camped. It was dark when we’d arrived; we set up our tents using headlamps for light. While we erected our temporary village, dinner was prepared for us over an open fire in a log cabin nestled amongst a grove of birch. At dinner, we all gathered and made introductions. John, our tour leader, was an intrepid and taciturn New Zealander. Rugged adventure was his job. He made a living taking people to places not typically thought of as holiday destinations: Afghanistan, Mongolia, Kazakhstan. We sipped and talked; I listened carefully to everyone’s stories. Many on the expedition were deeply passionate about adventure, but I sought more than that. I sought someone very determined to pursue her wildest dream, despite all the inherent obstacles. Amangul, our guide, was broad-chested and had two gold teeth. Her gray eyes sparkled when she laughed, which was often, even on that otherwise shy first night. A wife and mother of three, she seemed to be in her forties, though John said I wasn’t allowed to ask. My friend Tracey was there too; she’d flown from Scotland to make the trip, and had had her own challenges leaving her two small children behind. Tracey was passionate about horses, and for years dreamed of riding in the Altai Mountains on the region’s legendary steeds. Nicki and Lorraine were a pair of adventurers who’d road-tripped from Mongolia to Kazakhstan while on holiday from their jobs at New Zealand’s Department of Conservation. There were also a couple of hearty Alaskans, one single dad from California, and two accomplished equestrians from the U.K.
First thing the next morning, John, our guide, assigned horses to each of us. It had been about ten years since I’d ridden, back when I’d lived in Mongolia. Even then, I’d only ridden just enough distance to spend a few days in the steppe meeting nomadic families. I told John that I was capable, but I was afraid. Once assigned our ponies, we took off, led by Amangul and flanked by John and the rangers. Following a snaking riverbed, our group climbed steadily upward into the Altai. At first, the heat was searing. Then, elevation gave way to snow and ice. By day, we rode, sometimes as many as eight hours. The journey was arduous, even for the experienced riders. By night, we gathered around the campfire. Someone would pass around a flask of aged whiskey, or Kazakh vodka. We sipped and talked; I listened carefully to everyone’s stories. Many on the expedition were deeply passionate about adventure, but I sought more than that. I sought someone very determined to pursue her wildest dream, despite all the inherent obstacles. Those first few days, I held my cell phone in one hand while holding the reins in the other. I had always known coming on this trip that I’d be without coverage for extended periods of time. But I hadn’t expected to be out of contact with my husband and kids for nearly a week. Anxiety returned. I gritted my teeth against panic attacks. I felt guilty and selfish. Alone in my tent at night, I rebuked myself aloud for wanting to fulfill my own dream while being a mother to young children. It was this though that made me ever more determined to succeed on my mission. I had to make this trip worth the price everyone in my family had paid for me to be here. One morning, our group set out beneath a heavy, leaden sky. It had snowed and sleeted the night before, and we’d awakened to sodden steppe surrounded by majestic peaks. John hadn’t told us the riding would be hard that day; he hadn’t needed to. It was cold and windy, and we were headed up and over the rocky Altai. Just as we were making our descent, horses picking their way carefully over slippery boulders and down steep pathways, the sky blackened, and then opened. “I can’t do this!” I shouted to John, who was riding behind me. John said nothing. We were crossing what was called the “Passage of Death,” a slippery escarpment too narrow to dismount. Though I didn’t think so at the time, John was doing me a great kindness by keeping silent. He was giving me a choice: succumb to my fears, or overcome them. Return home having failed, or return home with a story. I’d paid too high a price to fail. I was determined, determined to find a way to be both a mother and to be me. On I rode. Finally, our group successfully made its descent. We celebrated with Kazakh chocolate. Later, I fell into step with Amangul. 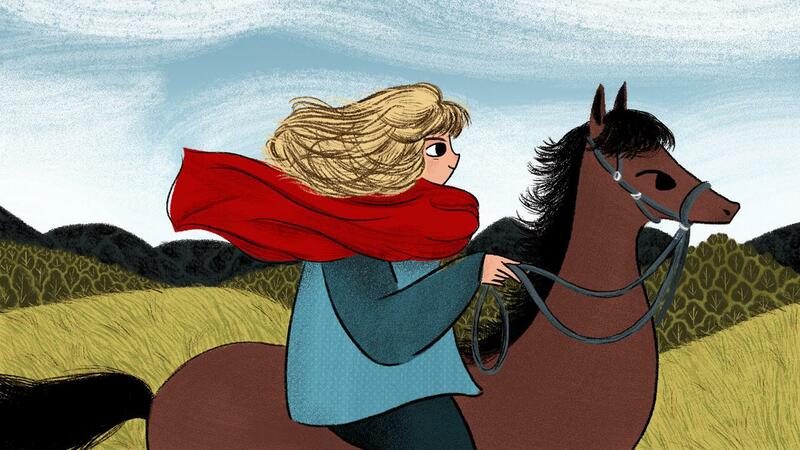 She always rode with one hand on her hip, one hand on the reins, and her eyes on the horizon. She rode the stallion. Amongst all the brawny outdoorsmen in our group, she was the only one to ever do so. On that day, Amangul wore a pink velour tracksuit with the words “Lady Lug” embroidered at the breast. I suppose it was meant to be “Lady Luck.” Amangul was leading us to her prize: a sapphire lake not far from the Russian border. The lake wound around a low mountain and some rolling fields; inhabitants were limited to brown bears and one farming family. Here, we set up camp in one of the remotest parts of Central Asia. Over the last three years, Amangul had staked out this destination. She’d traveled from her home in Mongolia on reconnaissance missions in this Kazakh wilderness to prepare for our group’s expedition. It was evident she’d had to sacrifice a lot. She’d successfully weathered storms, tangles with bureaucratic officials, and extended absences from her family. This journey was her calling, Amangul would tell us. That night, after a dip in the lake buttressed by Russia, I sat with Amangul. She’d caught and prepared a supper of small white fishes, and we all tucked in eagerly. Once again, someone passed around a flask. Amangul took a swig from it, and laughed heartily. I leaned back to gaze at the canvas of night sky above. Of course I knew. In Amangul, I’d discovered my dream follower. I learned that life can change quickly, even when it seems as though it will never change at all. I learned that to doggedly pursue what you’re passionate about will result in what you’re passionate about pursuing you in kind. But most important, I learned to always maintain a sense of self. She was sitting across from me; we were both picking at the last morsels of fish. It was late; most of our group had turned in for the night. A few remained, huddling in the cold night air around a dying campfire. As I watched Amangul simply beAmangul, I marveled at all that had happened here in this distant and enchanting land with this extraordinary and captivating woman, wife, and mother. What happened was that I’d learned three lessons I will never forget. I learned that life can change quickly, even when it seems as though it will never change at all. I learned that to doggedly pursue what you’re passionate about will result in what you’re passionate about pursuing you in kind. But most important, I learned to always maintain a sense of self. From Amangul, this majestic and intrepid mother following her own wildest dream despite all its inherent obstacles, I learned these indelible lessons. And for the first time in a long time, I felt like myself again. About a week later, I was home in New Zealand. Reuniting with my husband and children was one of the most profoundly delicious experiences I’ve ever had. My son is still too young to say much more than “cracker,” but my daughter insisted in coming along with me on my next expedition. She said so right away, just as she was leaping into my arms to hug me hello. Then, and now, it excited me to no end to envisage a future combining the two things I’m most passionate about: my family and my career. For now though, while my children are young, it’s enough to know that I can maintain this sense of self, that I do have a say, that I can still tell the stories I love to tell. That I can be me — and be a mother. Patricia Sexton is the author of “LIVE from Mongolia,” the true story of what can happen when you follow your wildest dream. With Nicki Atkinson, the filmmaker who was part of the Kazakh expedition, she filmed a short documentary about Amangul Sakei and the pursuit of dreams. Patricia is the host of “LIVE from New Zealand,” a radio program interviewing dream followers. This essay was originally published on Narratively. A digital publication that looks beyond the news headlines and clickbait, Narratively focuses instead on ordinary people with extraordinary stories. We comb the world’s big cities and hidden corners for the characters and narratives that mainstream media aren’t finding—the underdogs and overlooked tales that enlighten us, connect us, and capture our imagination. Explore more stories at Narratively.